Weeks of planning culminated, coincidentally, on National Coming Out Day. 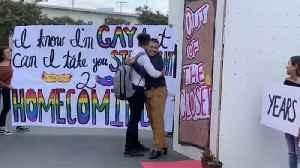 A gay high school student from California asked his straight friend to the homecoming dance -- and his answer will melt your heart. The pop chanteuse has frequently credited dancer and illustrator Pepe Muñoz with helping her rebound emotionally after the 2016 deaths of her husband, René Angélil, and brother Daniel. Though the..